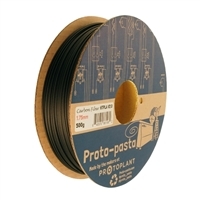 Proto-pasta's High Temp Carbon Fiber PLA (HTPLA-CF) combines engineering-grade performance with the ease and eco-friendliness of PLA printing. Compared to the Original Carbon Fiber PLA, HTPLA-CF has improved toughness for less breaking when handling and much better high-temperature resistance when annealed. Like in the Original Carbon Fiber PLA, the added carbon fiber increases stiffness and resistance to warpage. HTPLA-CF, like Aromatic Coffee, is based on our High Temp PLA v2.0, so it prints with ease and also has a potential Heat Deflection Temperature (HDT) in excess of 140C (285F) depending on processing. We had good results annealing (also called heat treating or crystallizing) in an oven at 110C (225F) for an hour. We recommend leaving the supports on your parts, placing them on a non-radiating surface (like glass, ceramic, or composite), and letting them cool in the oven to minimize distortion. Parts must be baked above 60C for any crystallization to occur.